Things have been pretty crazy busy for me in the last couple of weeks as the deadline for my book MADE IN AMERICA: OUR BEST CHEFS REINVENT COMFORT FOOD rapidly approaches. I have been testing so many rich comforting recipes there’s barely time to cook anything else and when it comes to meals most of the food we are eating is something that’s going to end up in the book. I have a recipe for farro with spring onions and white asparagus in the book – from John Sundstrom of Lark in Seattle – you’ll have to wait until October for that recipe – but I do want to share with you a fabulous way of cooking up farro for breakfast. It’s rich and creamy and definitely comforting. Farro is a great grain because it’s so versatile. You can use it in cold in salads – Nancy Silverton makes a tasty farro salad at Pizzeria Mozza with cucumbers and feta (one of my favorites). Hot it can be sweet or savory – Le Pain Quotidien sometimes have a seasonal special of farro with almond milk and berries – it’s a must. Here’s what I have been making up for breakfast – I can put a pot on the stove simmering away as I get set up for the day – a couple of stirs and a check or two of the water levels and it’s ready. It fills me up and I’m not craving something for elevenses. 1. 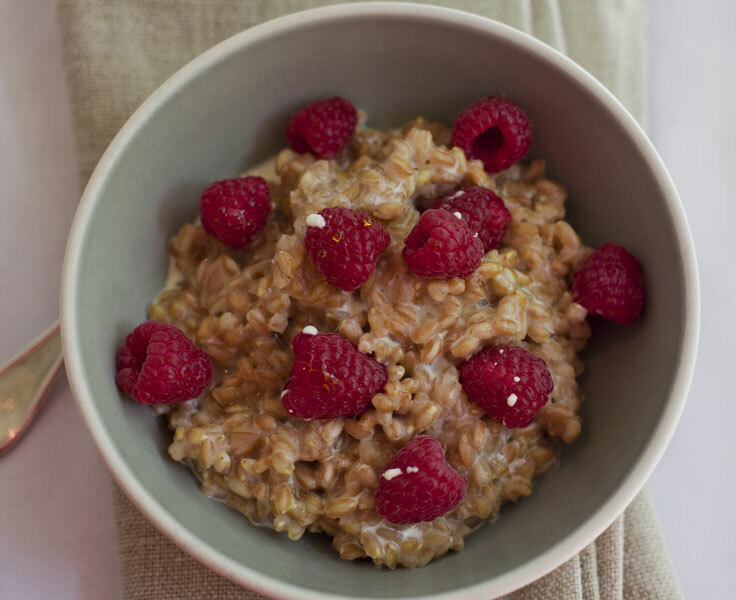 Place 1/2 pound farro in a small sauce pan with 1/2 teaspoon of salt and cover with water. Simmer for about 30 – 40 minutes until softened, make sure the farro doesn’t get too dry, add water as needed. When grains are soft and cooked through remove from heat and drain any excess water. 2. Trasfer to two bowls, scatter with raspberries and add 1 tablespoon whole milk or a tablespoon of greek yoghurt. Drizzle with maple syrup and enjoy! Lucy, great idea and I have a friend coming to visit this week and this is a perfect dish to make/chat/eat at breakfast while we catch up. Thx for the post.